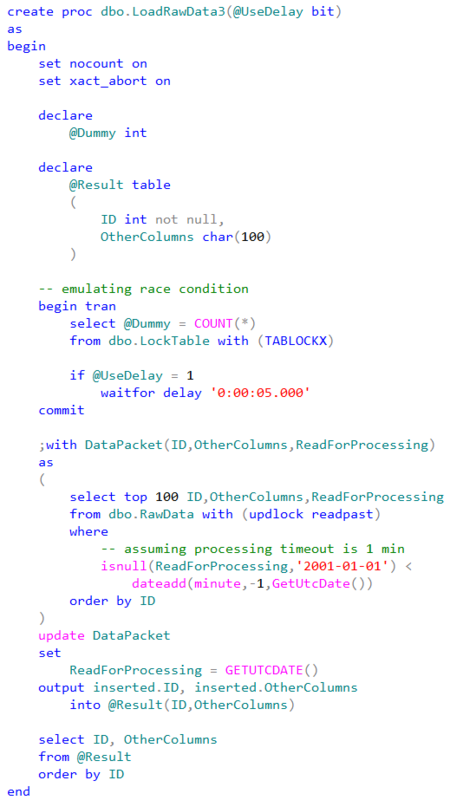 Today I’d like us to discuss how we can implement analog of Critical Section (or Mutex) in T-SQL. One of the tasks when it could be beneficial is when we need to prevent the multiple sessions from reading the data simultaneously. As the example let’s think about the system which collects some data and does some kind of post processing after data is inserted. One of the typical implementation in such architecture would be having the farm of the application servers that do the post processing. We usually need to have more than one server in such scenario for scalability and redundancy reasons. The key problem here is how to prevent the different servers from reading and processing the same data simultaneously. There are a few ways how we can do it. One approach would be using central management server that loads and distributes the data across processing servers. While it could help with the scalability we will need to do something to make that server redundant. Alternatively we can use some sort of distributed cache solution. We could load the data there and every server grabs and processes the data from the cache. That approach could be scalable and work great although distributed cache is not the easy thing to implement. There are the few (expensive) solutions on the market though if you don’t mind to spend money. There are of course, other possibilities but perhaps the easiest approach from the coding standpoint would be implementing application servers in the stateless manner and do the serialization while reading the data in T-SQL. Let’s create the table we can use in our exercises and populate it with some data. A couple things here. First of all, we need to handle the situations when application server crashes and make sure that data would be loaded again after some time by another app server. 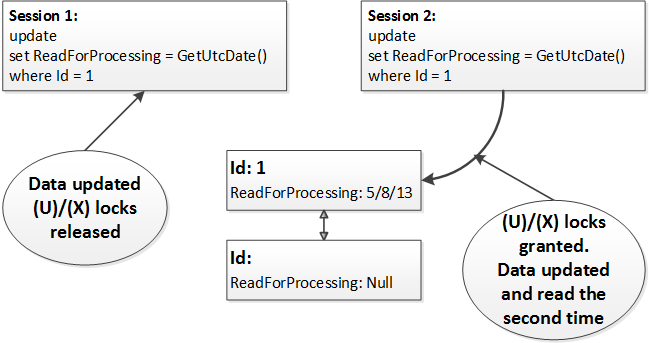 This is a reason why we are using ReadForProcessing datetime column rather than the simple Boolean flag. 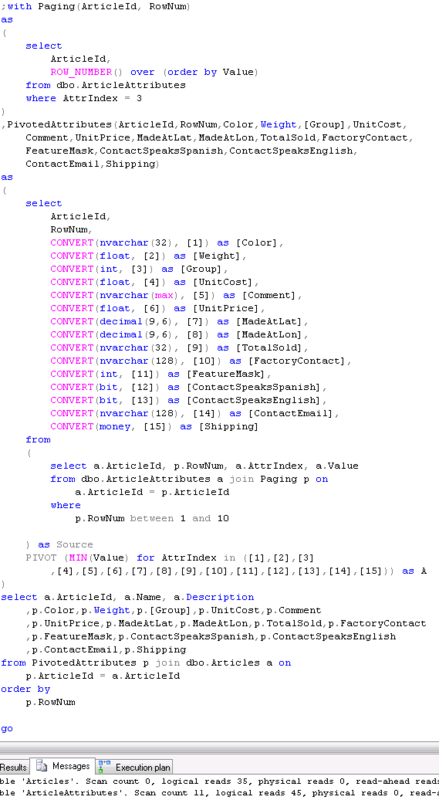 In addition to the index we also need to assign default value to ReadForProcessing column to avoid ISNULL predicate in the where clause to make it SARGable. We can use some value from the past. 2001-01-01 would work just fine. The problem here is the race condition when two or more sessions are starting to read and update the data simultaneously. Our update statement would obtain shared (S) locks during select in CTE and after that use update (U) and exclusive (X) locks on the data to be updated. 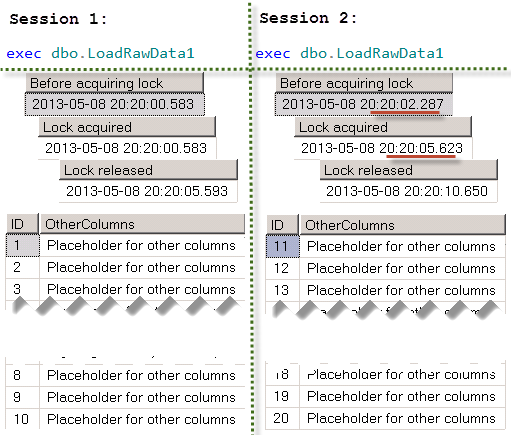 Obviously different sessions would not be able to update the same rows simultaneously – one session will hold exclusive (X) lock on the row while other sessions would be blocked waiting for shared (S) or update (U) lock. 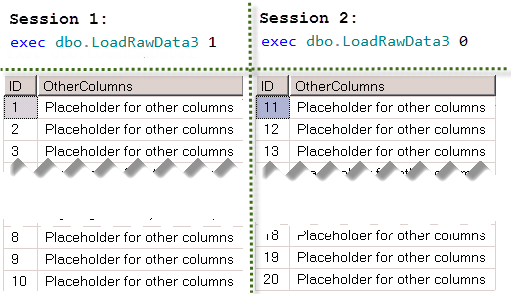 In the first case (shared (S) lock), it’s not a problem – the blocked session will read new (updated) value of ReadForProcessing column as soon as the first session releases the exclusive (X) lock. But in the second case the second session will update (and read) the row the second time. Simplified version of the process is shown below. At the first step both sessions read the row acquiring and releasing shared (S) locks. Both sessions evaluate the predicate (isnull(ReadForProcessing,’2001-01-01′) < dateadd(minute,-1,GetUtcDate())) and decided to update the row. At this point one of the sessions acquires update(U) and then exclusive (X) lock while other session is blocked. After the first session releases the exclusive (X) lock, the second session updates the same row. How can we avoid that? We can create another resource and acquire exclusive lock on that resource before update statement from within the transaction. As we remember, exclusive (X) locks held till the end of transaction, so we will use it as the serialization point. 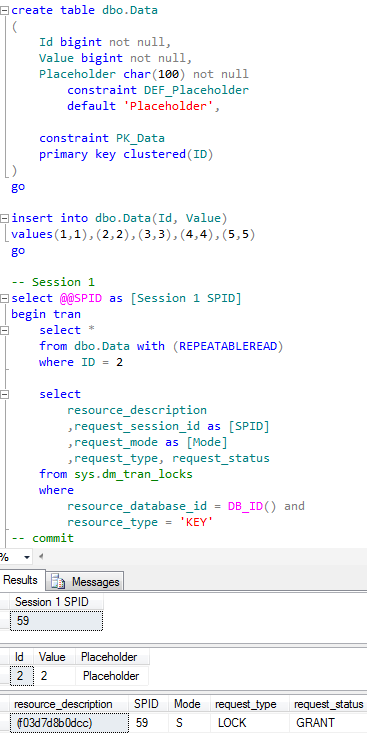 Let’s take a look how it works by creating another table as the lock resource. Now, if we start transaction, we can obtain exclusive table lock. Again, exclusive (X) locks held till the end of transaction, so other sessions would be blocked trying to acquire the lock on the table. As result, execution of our update statement would be serialized. We can test that approach by running this SP from the multiple sessions simultaneously. There is the artificial delay which we are using during the testing just to make sure that we have enough time to run SP in the different session. While that approach works, there is another, better way to accomplish the same task. We can use application locks. Basically, application locks are just the “named” locks we can issue. We can use them instead of locking table. That would lead to the same results. 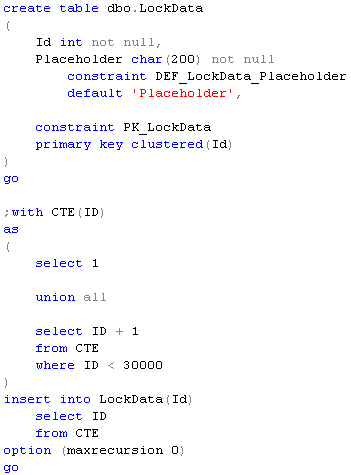 Application locks are also very useful when we need to implement some code that alters the database schema (for example alter partition function) in the systems that are running under load all the time (24×7). 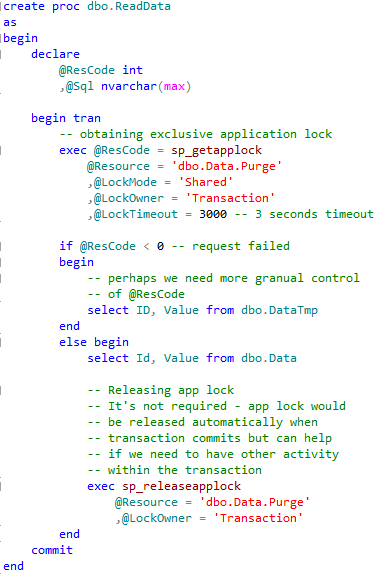 Our DDL statements can issue shared application locks while DDL statements acquire exclusive application locks. This would help to avoid deadlocks related to the lock partitioning. You can see the post about lock partitioning with more details about the problem and implementation. Although, if we talk about specific task of serialization of the reading process, we don’t need critical section at all. We can use the locking hints instead. As you can see, there are two locking hints in the select statement. 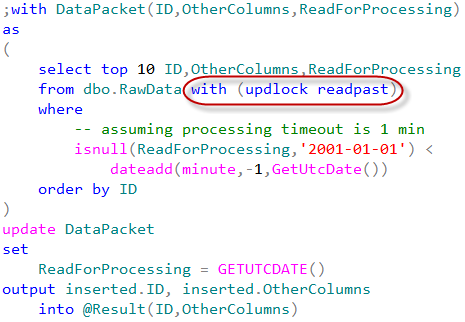 UPDLOCK hint forces SQL Server using update (U) locks rather than shared (S) ones. Update locks are incompatible with each other so multiple sessions would not be able to read the same row. 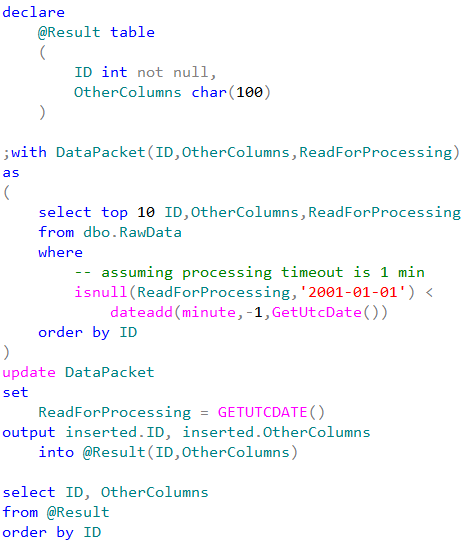 Another hint – READPAST – tells SQL Server to skip the locked rows rather than being blocked. 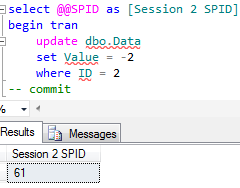 Let’s modify our stored procedure to use that approach. 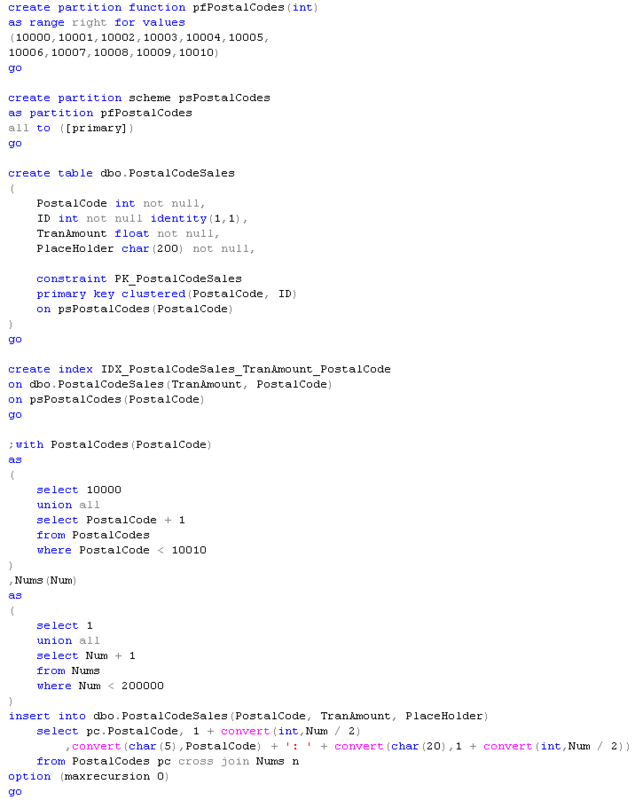 I’m adding some code to the procedure to emulate race condition. In one session we will run the stored procedure with @UseDelay = 1. In another with @UseDelay = 0. Both of those sessions will start to execute the main update statement roughly at the same time. This method works even more efficiently than the “critical section” approach. 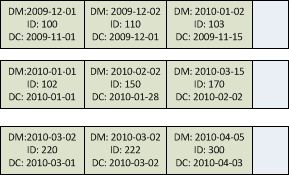 Multiple sessions can read the data in parallel. Well, I hope that we achieved two goals today. 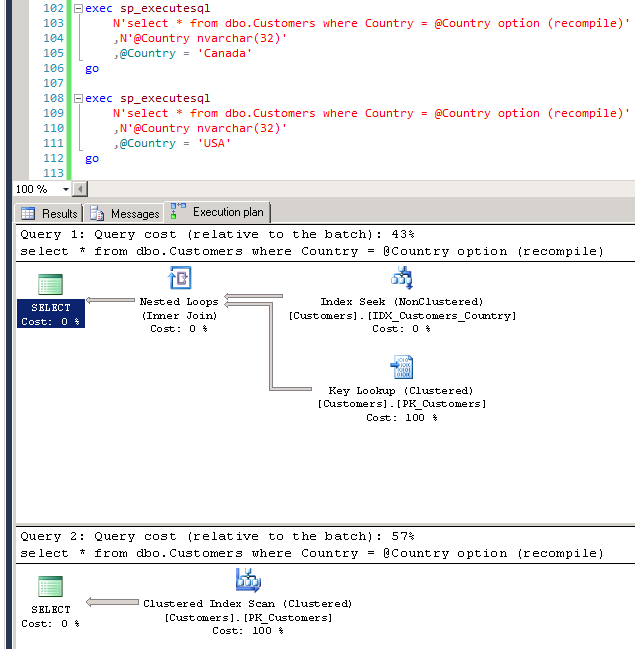 First – we learned how to implement critical section and/or mutexes in T-SQL. But, more importantly, I hope that it taught us that in some cases, the “classic” approach is not the best and we need to think out of the box. 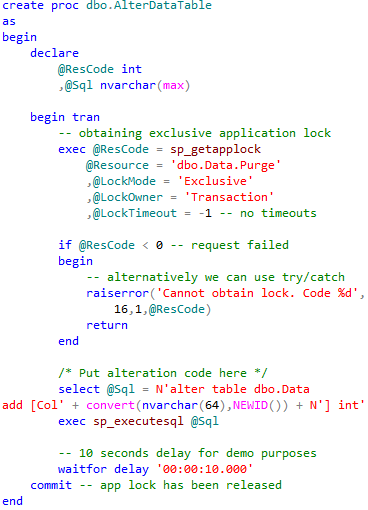 Even when this thinking involved the standard functional available in SQL Server. 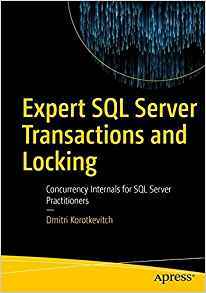 This entry was posted in SQL Server 2005, SQL Server 2008, SQL Server 2012, T-SQL and tagged Application locks, Locking on May 8, 2013 by Dmitri Korotkevitch. occurs although it would still mean that we have to do our job manually. 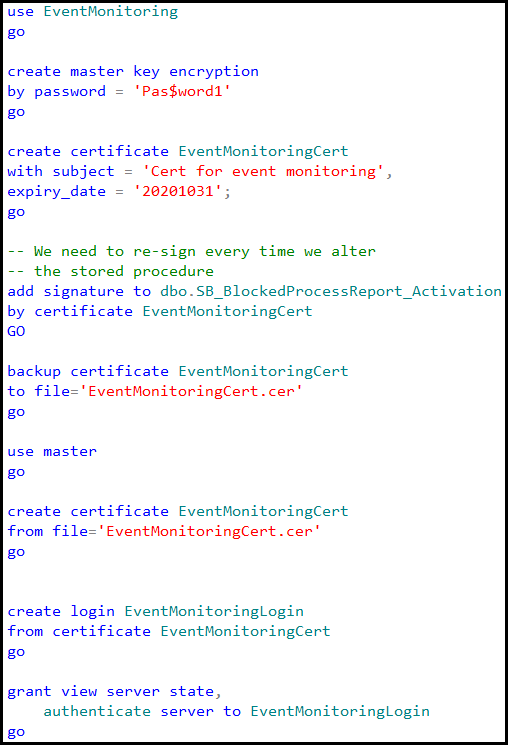 As another option we can use Event Notification for BLOCKED_PROCESS_REPORT event. 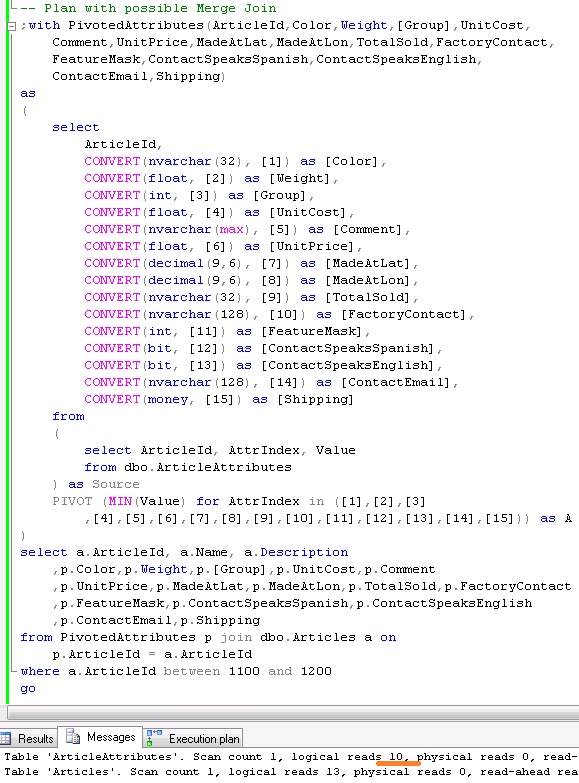 This approach would utilize Service Broker so we would be able to create activation stored procedure and parse blocking report there. Let’s take a look at that. At that point we would have blocked process report events going to dbo.BlockedProcessNotificationQueue service broker queue. Assuming, of course, that we have blocked process threshold option set. Obviously we do not want to have those messages sitting in the queue – it’s kind of defeating the purpose of having the process automated. What I would like to do at this point is shredding event data and putting it to the table for analysis. 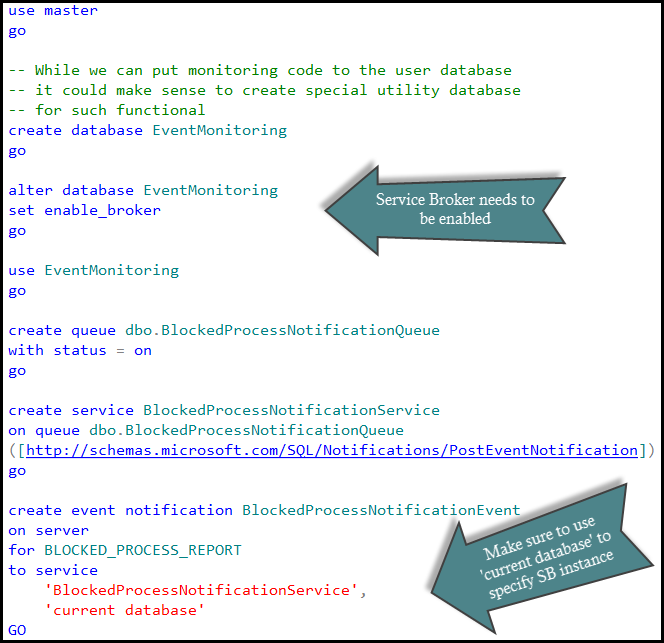 Another important factor is that blocked process monitor would generate separate events for the same blocking condition every time it wakes up. For example, if we have blocking process threshold set to 5 seconds, we can get five events until our query times out after 30 seconds. Ideally I’d like to combine those events into the single one to have analysis simplified. So let’s create the table to store the data. TranCount – if it’s more than one, it would tell us that we have nested transactions and again, perhaps, client does not handle them correctly. In any case, we will have full report stored and can access it if needed. And of course, we can modify the table and add extra attributes if we want to. Now it’s the time to put the activation procedure in place. I’m going to cheat a little bit here – click at the link to the source code at the end of the post to see it. There are two things I’d like to mention though. First one is how we get the query plans. For the blocked process we are trying to get it from sys.dm_exec_requests first. This is the only bullet-proof way to get the real plan but it would work only if the statement is still blocked when activation SP executes. 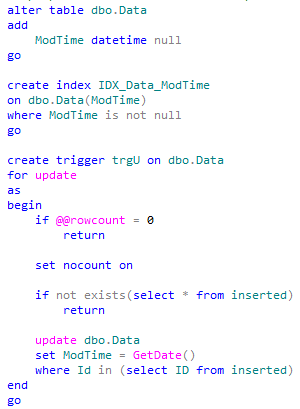 If this is not the case we are using sys.dm_exec_query_stats DMV. There are a couple challenges though. First, there is the chance that plan would not be there – for example in case of the memory pressure. Alternatively we have the situation when there are multiple plans due recompilation. 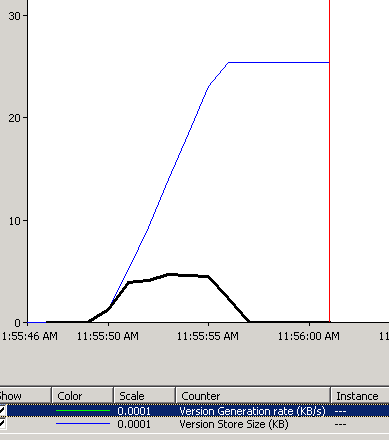 We are trying to guess the right one by filtering based on the blocking time but that method is not always working. So no guarantees. 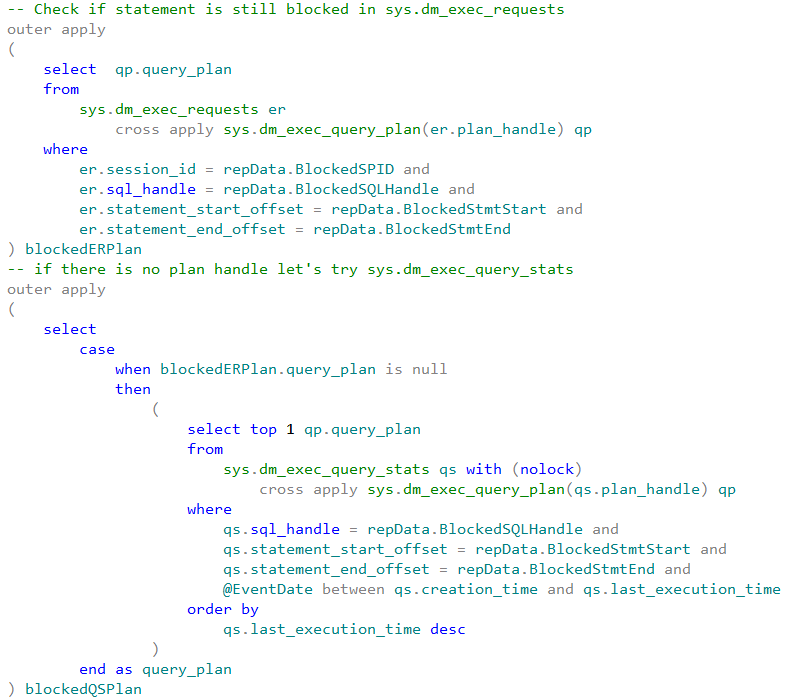 For the blocking process we are always using sys.dm_exec_query_stats picking up the top (random) plan. Another thing is how we are looking up if there are other events for the same blocking. 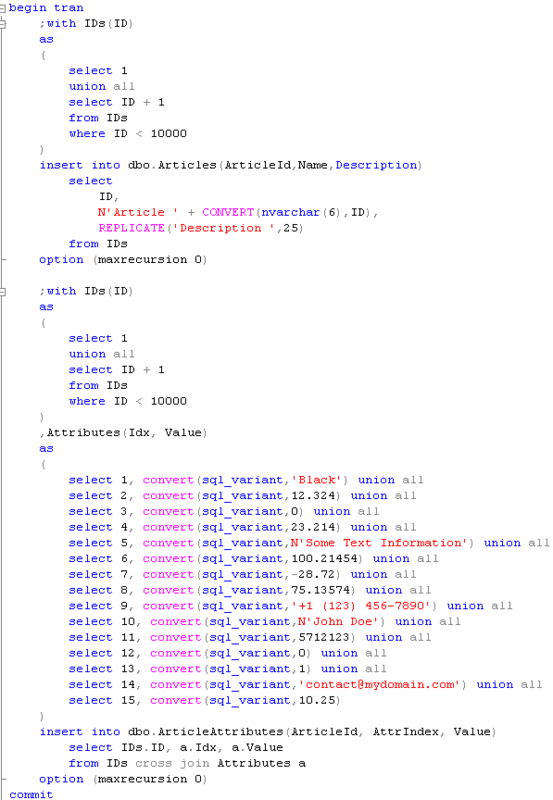 Basically stored procedure is trying to match various columns in the merge statement – perhaps even more than needed – but in either case I’d rather have duplicate records than incorrect information. And now it’s time for the testing. Let’s create the small table and populate it with a few records. Next, let’s place exclusive (X) lock on one of the rows in the first session. 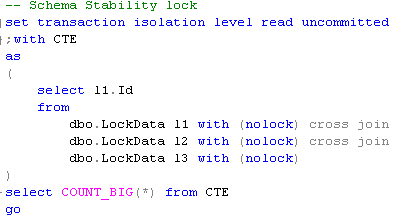 In another session let’s introduce the table scan in read committed isolation level. If we query the service broker queue we would see that there are a few events there. Our queue does not have automatic activation yet. And finally let’s alter the queue to enable the activation. 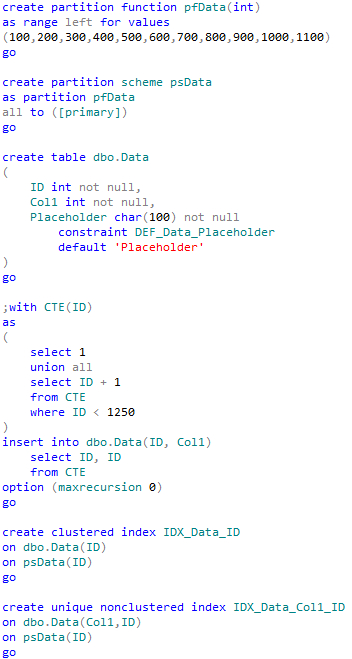 Next, let’s query the table. 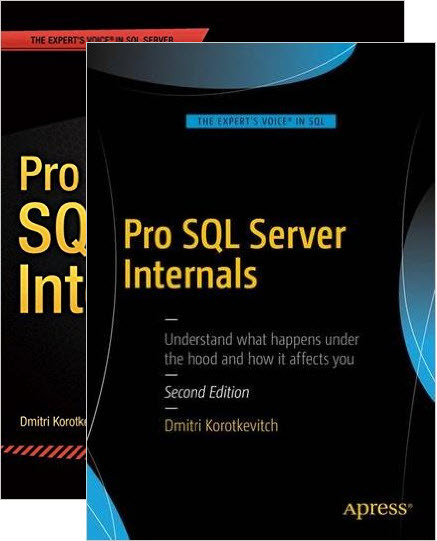 This entry was posted in SQL Server 2005, SQL Server 2008, SQL Server 2012, T-SQL and tagged Blocking Processes, Event Notification, Locking, Monitoring on April 8, 2013 by Dmitri Korotkevitch. A while ago triggers were slow. Very slow. 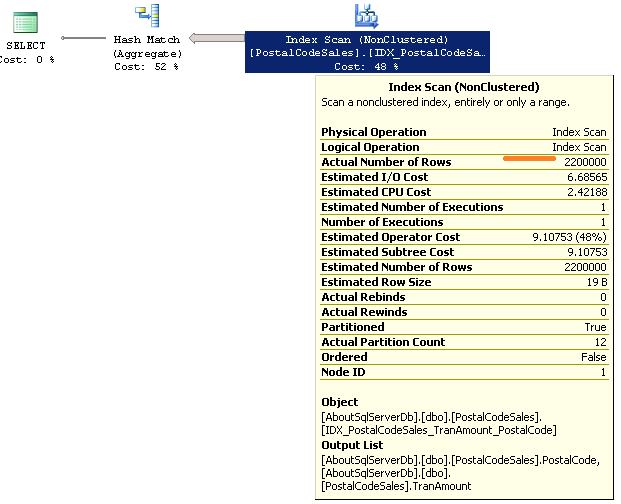 In the versions prior to SQL Server 2005, triggers scanned transaction log in order to build internal inserted and deleted tables. That approach has been changed in SQL Server 2005 when triggers started to use version store – similarly to what optimistic locking is using. That helps with performance but same time introduces a few interesting issues. Let’s take a look. First of all, let’s create a table and populate it with some data. 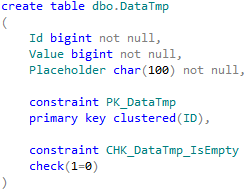 I would like to point that I’m using tempdb in that example mainly to show that this behavior is completely independent from transaction isolation levels and optimistic locking database options. As you can see, we have 65 bytes rows without any fragmentation. So far so good. Now let’s update Value column. We updated fixed-width column. Row size has not changed. No fragmentation here. As the next step let’s create a trigger. Still the same thing. But if we look at performance monitor counters – we can see that update now generates version store activity. As the next step I’d like to add LOB column to the table. 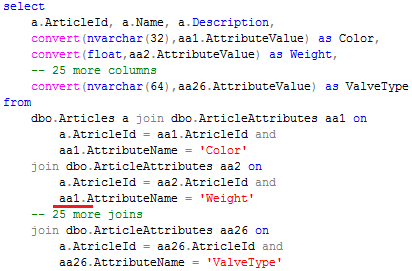 I’m using varchar(max) but you can replace it with nvarchar, binary, xml or clr data type. It would be the same. 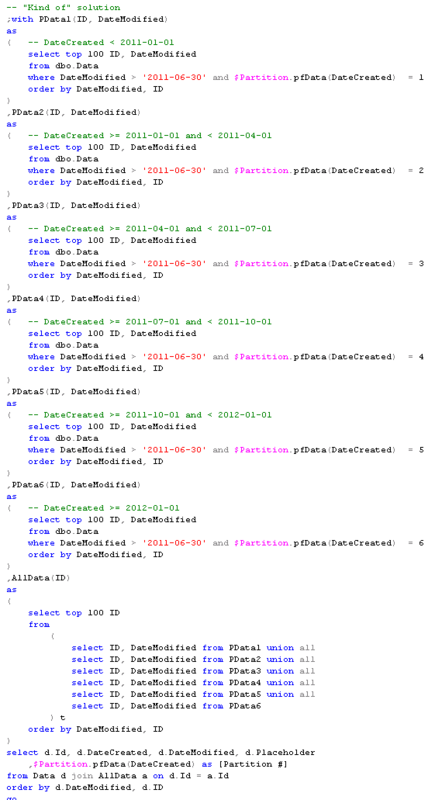 Column is nullable so alteration here is pure metadata operation. And now let’s run the update statement. Oops – now we have 14 bytes version store pointer added to the row. That introduces heavy fragmentation (new versions are larger so they don’t fit into the pages) and double our storage space. Well, a little bit unexpected development. Generally speaking this is very similar problem with what we have with data modifications when we use optimistic isolation levels. OK, it happens with LOB columns. Now let’s check the case when ROW OVERFLOW is possible. 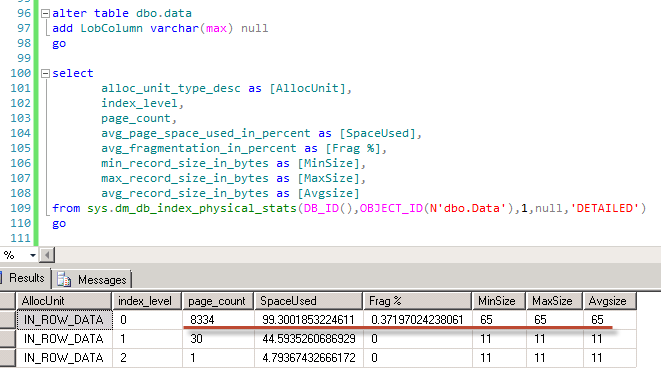 Let’s drop LOB column and add to varchar(5000) columns here. 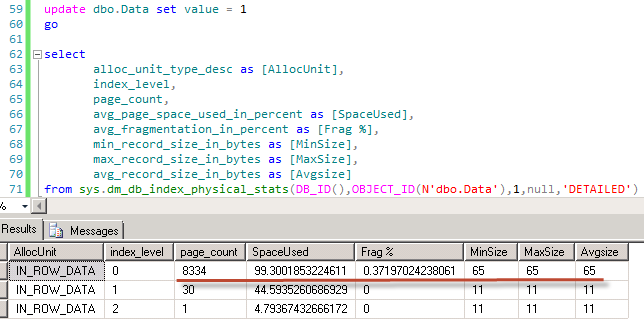 Again, we rebuilt the index – 14 bytes pointers are went away. Now let’s run update statement again. Same thing – extra 14 bytes and fragmentation. And next – run update again. As you can there are no 14 bytes version store pointer nor fragmentation. At last, let’s take a look at the very interesting thing – let’s see what happens when we have ON DELETE trigger. 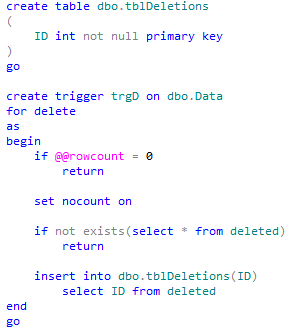 Generally speaking, when we delete the row, only thing that SQL Server initially does is mark row as the “ghost” row. Just the change in the header. But with the trigger the situation could be different. You can see, that in our case we ended up with page split on delete! This behavior adds extra arguments to the discussion why triggers are bad in general. 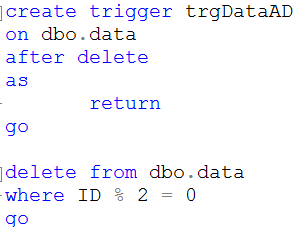 Triggers add extra load to tempdb. And in case if you have the possibility of row overflow or LOB allocations, you’d end up with 14 bytes version store pointer and extra fragmentation. P.S. I’d like to thank Paul White for his help with that post. 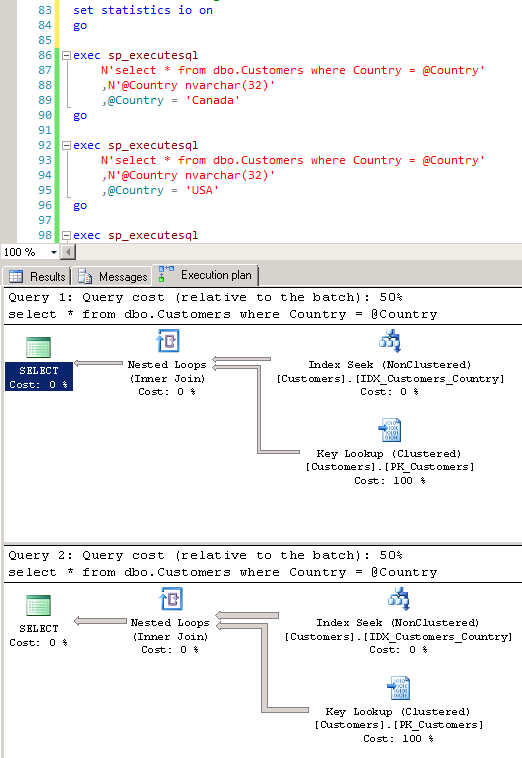 This entry was posted in General, SQL Server 2005, SQL Server 2008, T-SQL on July 10, 2012 by Dmitri Korotkevitch. 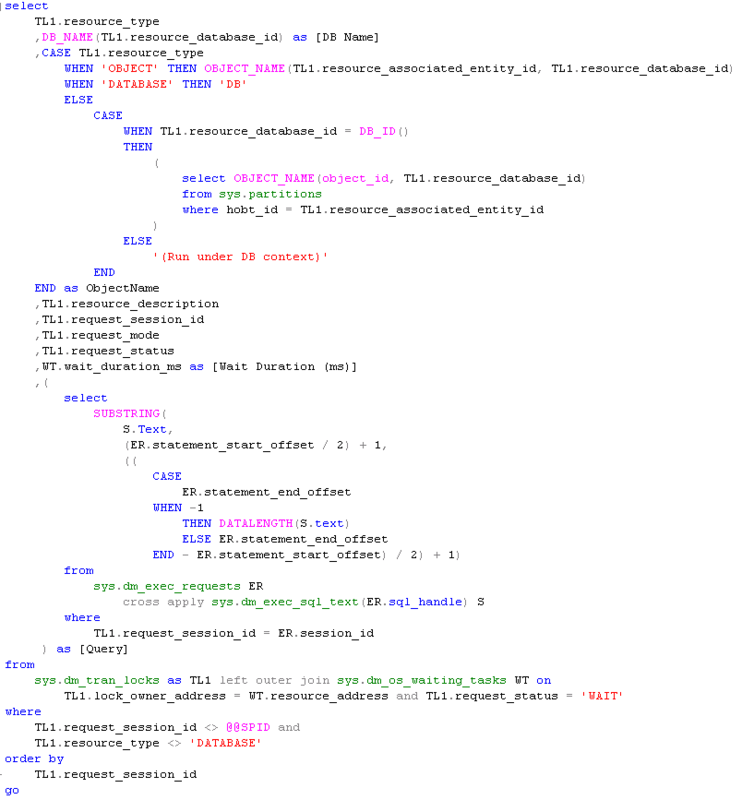 Today I’d like us to talk about statement level recompilation and how it could help us in a few particular scenarios. 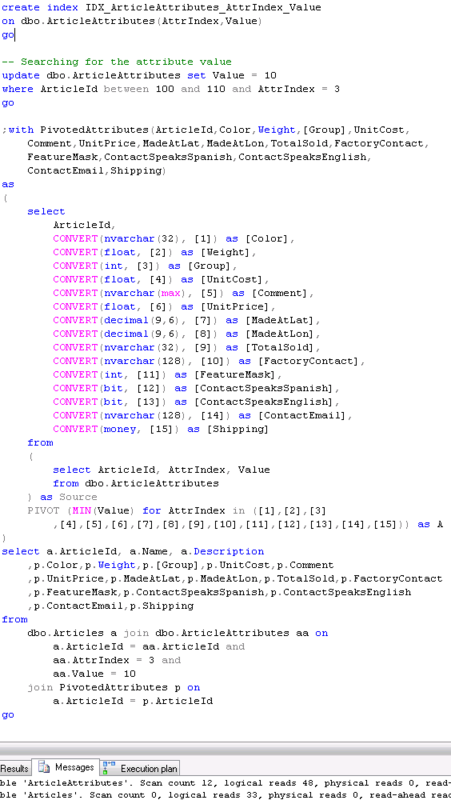 Such as parameter sniffing, search with optional parameters and filtered indexes. But first of all, let’s talk why do we need to worry about that at all. Let’s look at extremely oversimplified picture. 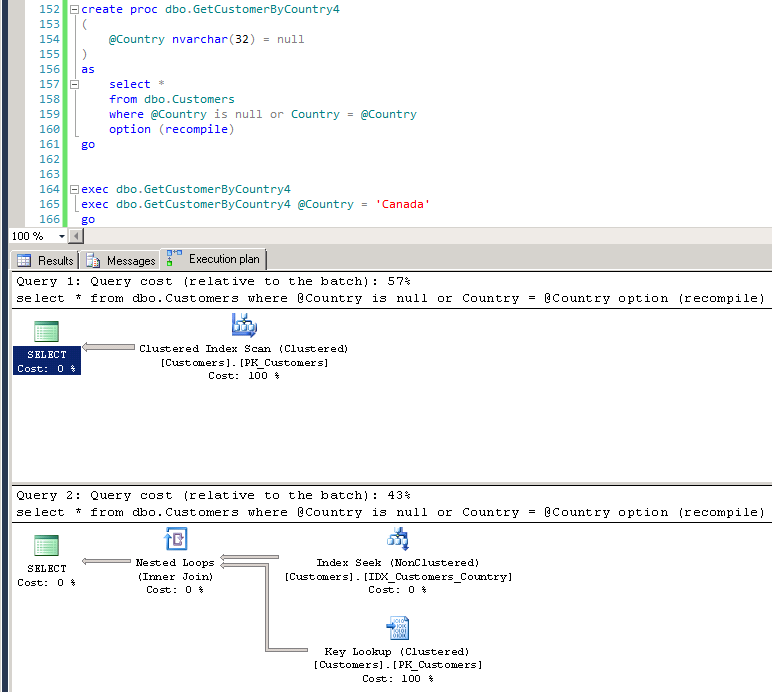 When we submit the query to SQL Server, one of the first things SQL Server is doing is compiling the query. Compilation itself is not cheap, especially in case of complex queries. 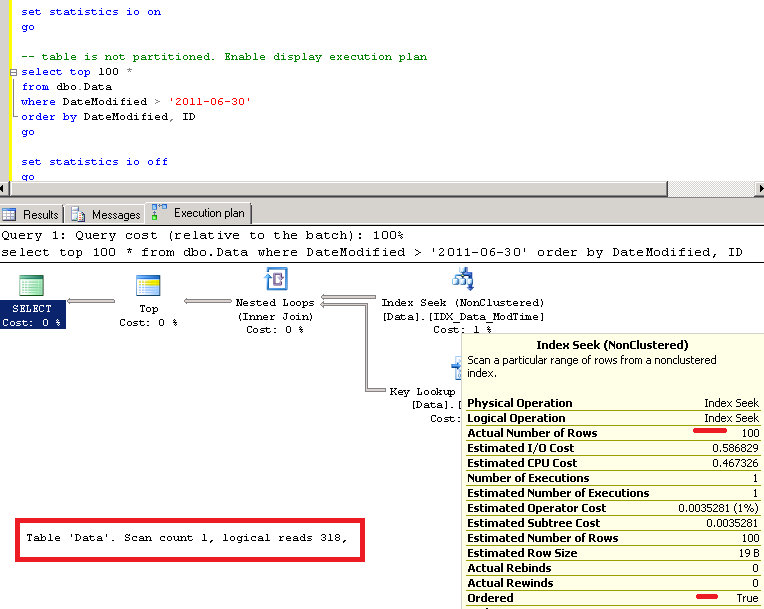 As result, SQL Server tries to cache execution plan and reuse it when the same query runs again. 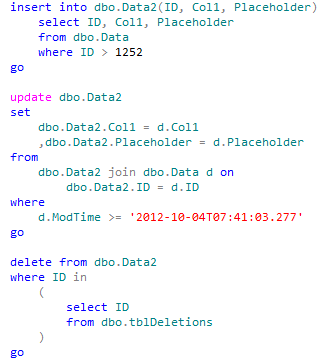 The interesting thing happens in case if query has parameters. 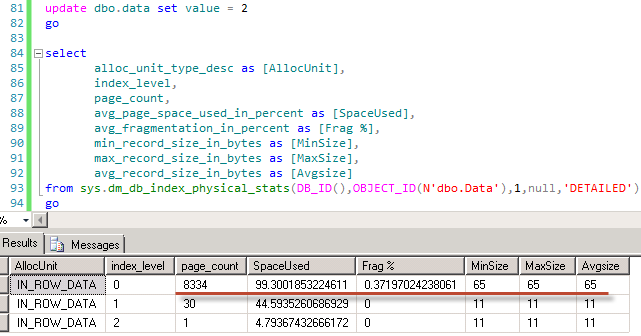 SQL Server is looking at actual parameter values during compilation/recompilation stage and using them for cardinality estimations. This called parameter sniffing. As result, the plan (which will be cached) would be optimal for specific set of parameters provided during compilation stage. Next time, when SQL Server reuses the cached plan, there is the chance that plan would not be good for another set of values. Let’s look at specific example. Let’s think about company that is doing some business internationally although most part of the customers are in USA. Let’s create the table and populate it with some data with ~99% of the customers in US. In addition to that let’s create an index on Country column. Images below are clickable. 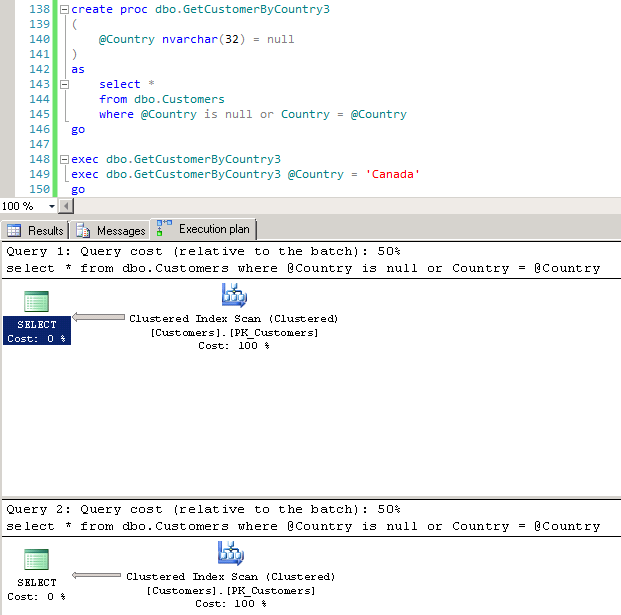 Now let’s execute the query that selects customers for particular country. 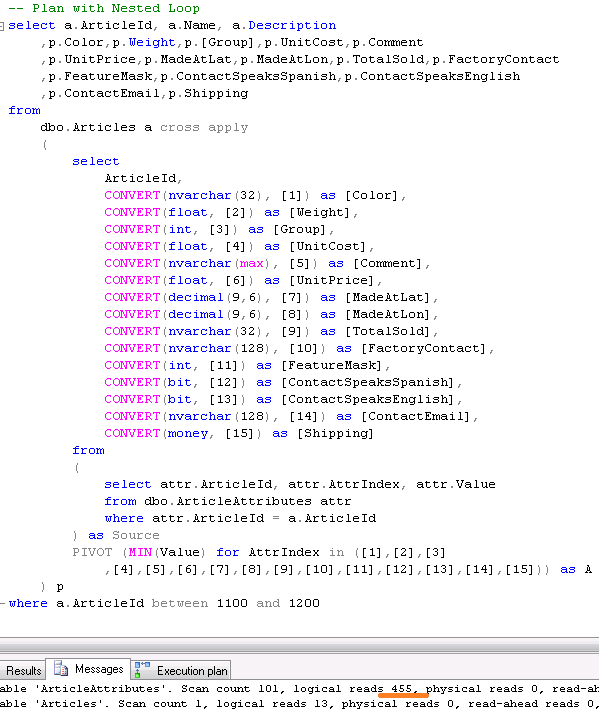 Most part of the client libraries would generate code like that. 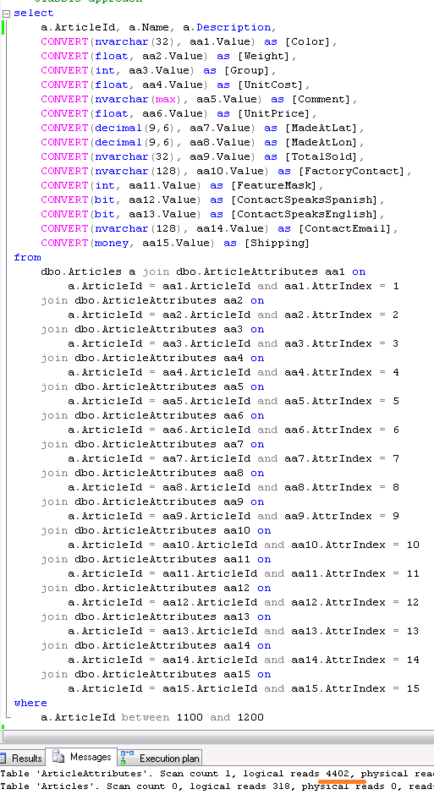 Just to prove inefficiency – let’s run the query again but use constant instead of parameter. 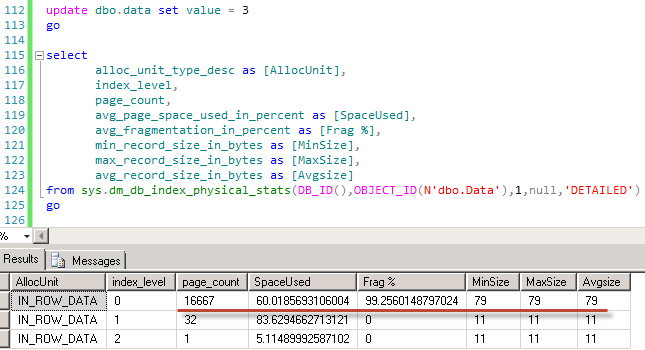 You can see that SQL Server chooses clustered index scan which introduces ~50 times less logical reads in compare with original non-clustered index seek. The same thing happens if we use stored procedures. 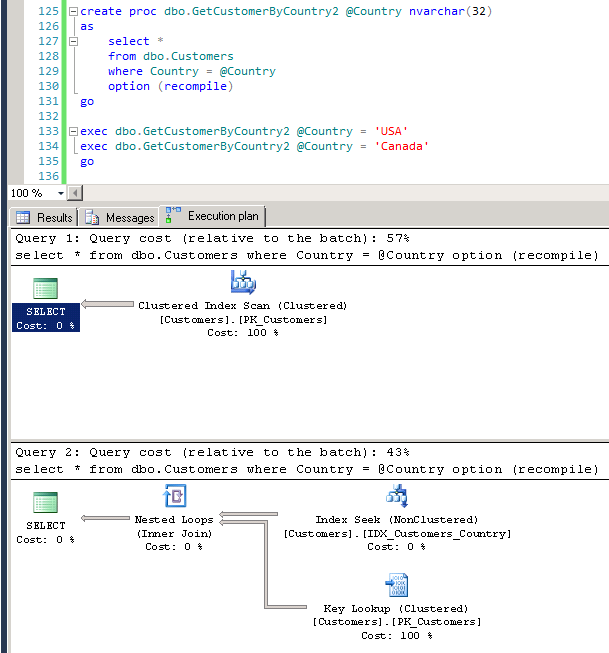 Now we can see the opposite effect – when we run this SP with @Country = ‘USA’, it generates clustered index scan. And reuses the same plan for Canadian customers. And this is real problem if we have data that distributed unevenly. Something forces recompilation and if we are “lucky enough” to have first call with untypical set of parameters – the inefficient plan would be cached and used for all queries. Obviously the downside of that particular method would be recompilation cost. Recompilation would happen every time the query executes. 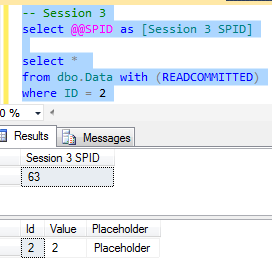 As we can see, because plan is cached SQL Server is unable to generate the plan that would be valid regardless of parameter value. So clustered index scan is the option here. Now, if we add OPTION (RECOMPILE) to the statement, it would change the picture – as you see, it generates optimal plan in every case. 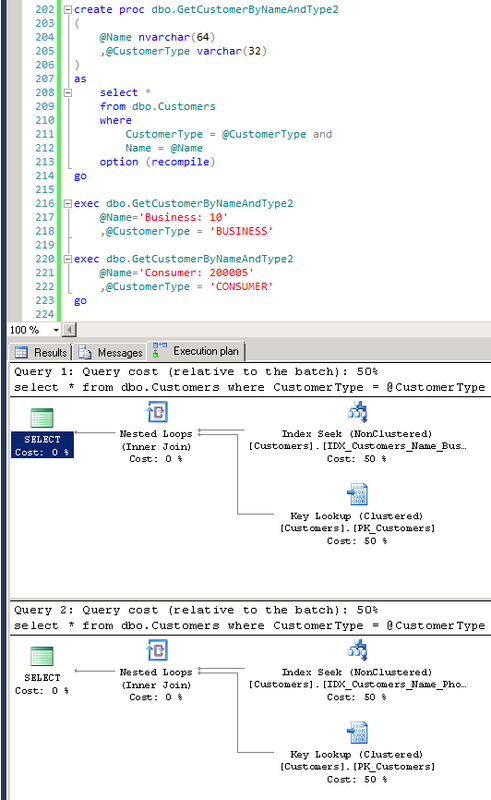 Is it better than the method with dynamic SQL I demonstrated in the old post – it depends. 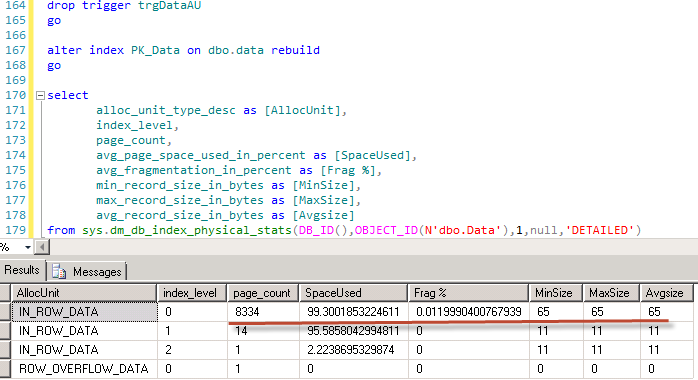 One of the downsides I have with recompilation is that plan would not be cached (which is, of course, expected) and would not be present in results of sys.dm_exec_query_stats DMV. I’m using this view all the time during performance tuning to find most expensive queries. Of course, I can catch those statements with other tools but that is less convinient for me. It’s questionable if OPTION (RECOMPILE) here is better than IF statement. But the point I want to make is if you’re using filtered indexes and filter value is provided as parameter, you should avoid plan caching if you want filtered indexes to be used. 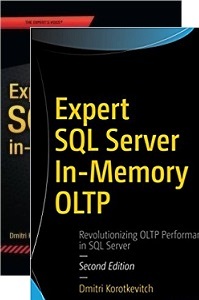 This entry was posted in General, SQL Server 2005, SQL Server 2008, T-SQL on May 18, 2012 by Dmitri Korotkevitch. 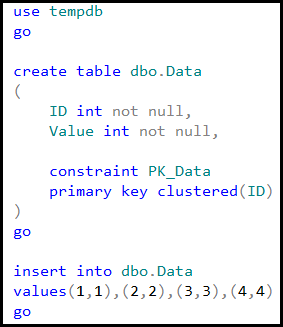 Sunday T-SQL Tip: Aligned non-clustered indexes on partitioned table – again.. If you read my blog for some time, you could see that I’m a bit addicted to that subject. But I saw quite a few cases when people started to have performance issues and very suboptimal plans with non-clustered indexes after they partitioned the tables. I’ve already blogged about that problem in general here as well as demonstrated one of the workarounds for one particular case. Today I want to show how to make that workaround a little bit more clean and clear as well as generalize that approach a little bit. Before we begin, please take a few minutes to read and refresh my previous post. It defines the problem and explains why we have the issue with the index. You also need the script to recreate the data. 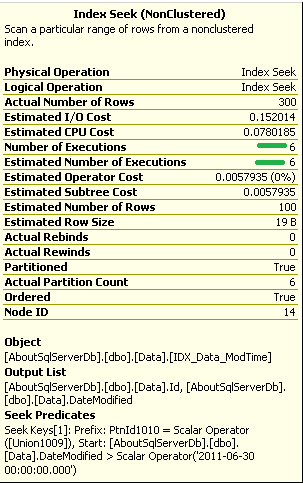 As you can see, SQL Server expected to execute index seek just 2 times but we have 6 partitions here. 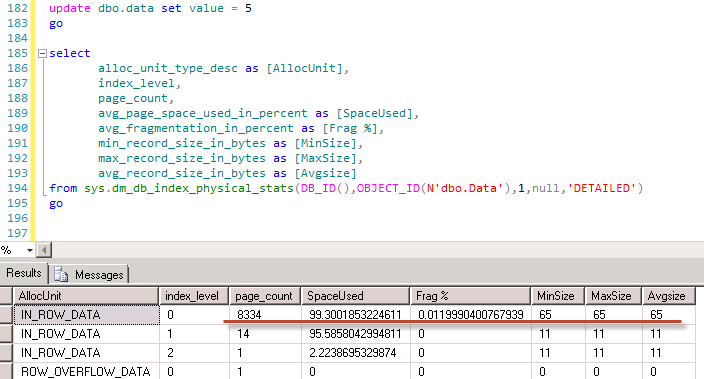 Well, even if sysobjvalues table has column level statistics on value column, it would not help us much here. 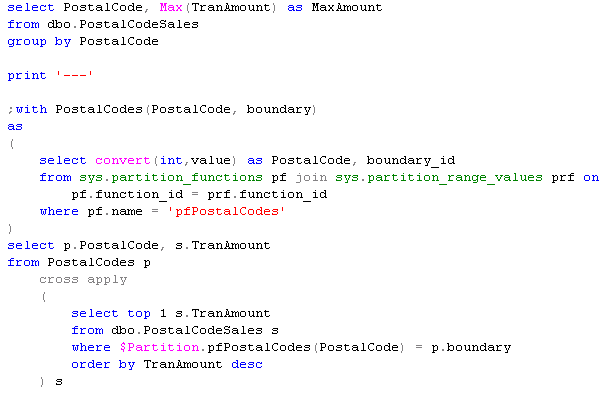 We can, of course, try to help SQL by removing join with sys.partition_functions; but still.. It could be incorrect. 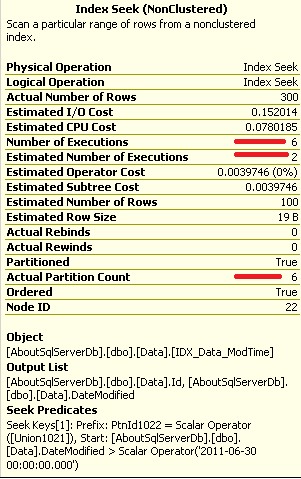 Of course, even if number of partitions is large, there is always dynamic SQL if you want to use it. You can construct numbers in the Boundaries CTE with that. 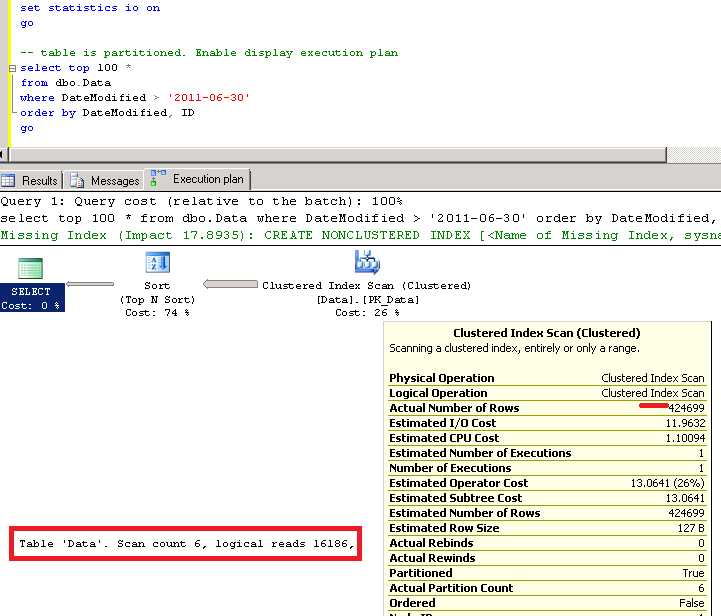 As you can see, table has aligned non-clustered index on TranAmount. Now, let’s say we would like to find max transaction amount per postal code. On the physical level we would like to get Max TranAmount per partition. Below are 2 select statements – first is the classic approach. 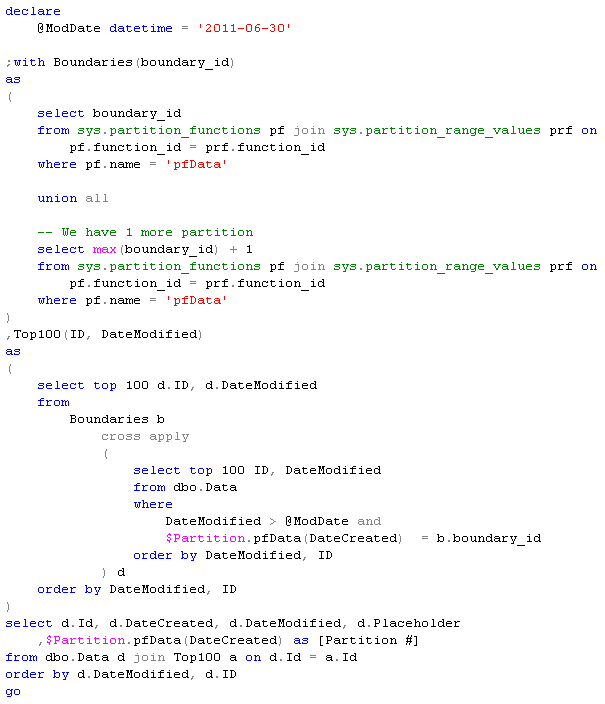 Second one is using $Partition function. Second select introduces separate top 1 “scan” on each partition. And you can compare Statistics IO here. 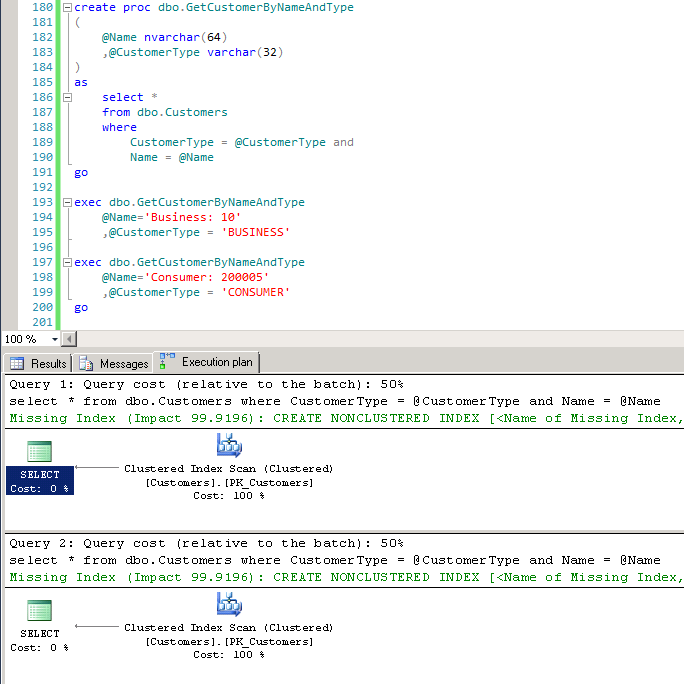 This entry was posted in General, SQL Server 2005, SQL Server 2008, T-SQL on March 11, 2012 by Dmitri Korotkevitch. 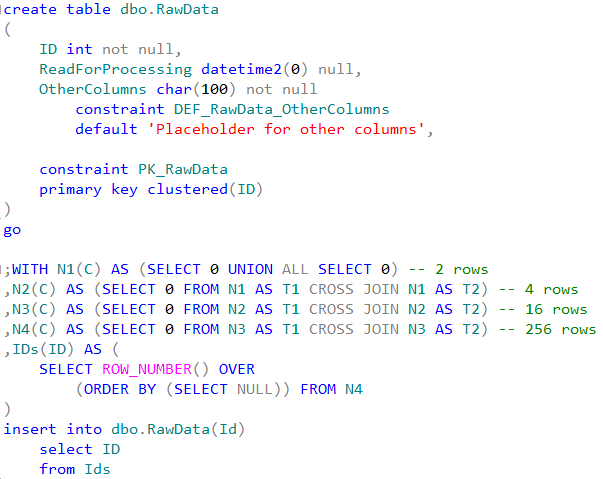 Almost one year ago I blogged about table partitioning in Microsoft SQL Server. 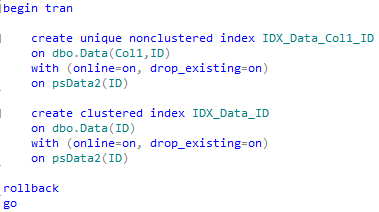 I mentioned one specific case when table partitioning hurt the performance – case when you need to select top N rows using aligned non-clustered index. I said that there is no good workarounds for this particular case. Well, there is one. Kind of. First, let’s take a look at the original problem. I adjusted the script I used an year ago a little bit. 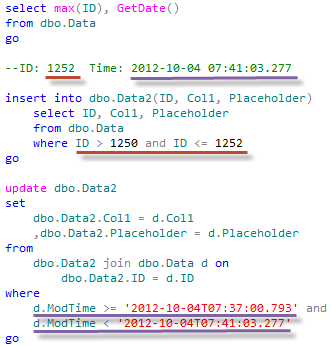 First, assuming we have non-partitioned table with clustered index on ID and non-clustered index on DateModified date. Let’s create that table an populate it with some data (if you click on the images below those would be opened in the new browser window). Now let’s say we need to select top 100 rows based on DateModified column. This is quite typical scenario you’re using in production systems when you need to export and/or process the data. 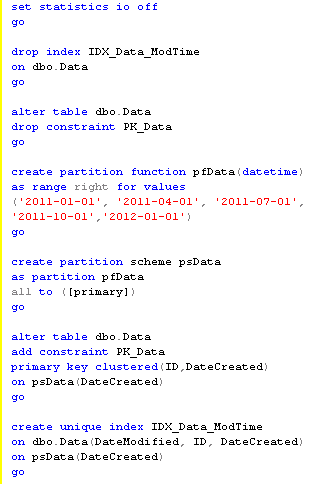 As long as table is not partitioned, you can see that plan is very good. 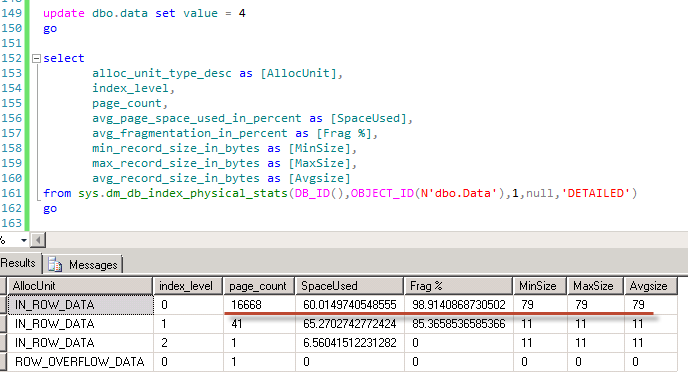 Basically SQL Server looks up the first row in the non-clustered index for specific DateModified value and do the ordered scan for the first 100 rows. Very efficient. Now, let’s partition the table based on DateCreated on quarterly basis. And now – let’s run that statement again. 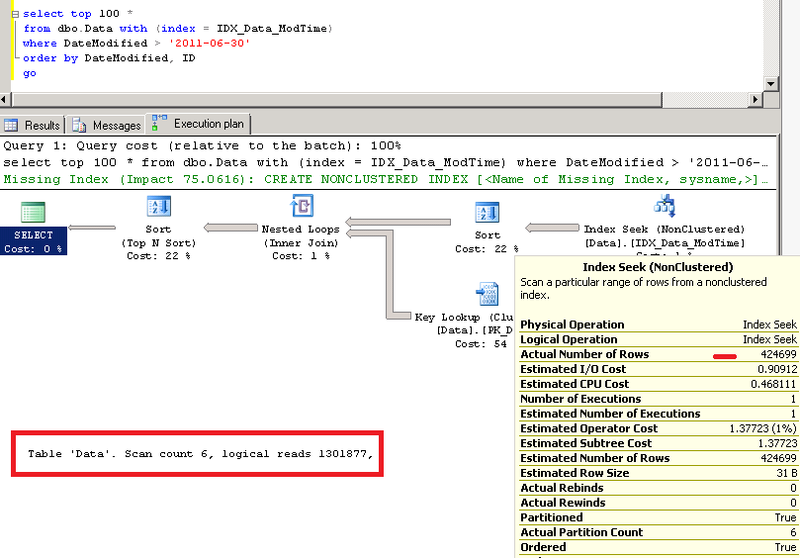 As you can see, SQL Server started to use CI scan with SORT Top N. I explained why it happened in the previous post. 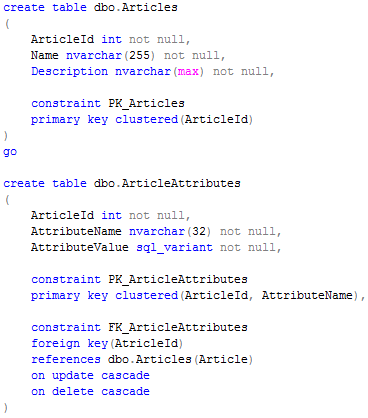 If we force SQL Server to use the index, the plan would be even worse in this particular case. 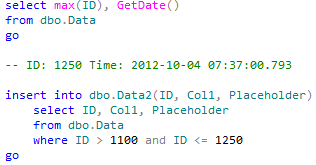 Although If you have the huge transactional table and # of rows with DateModified > ? is relatively small, the plan above could be more efficient than CI scan but SCAN/SORT TOP N would always be there. Is there solution to this problem? Well, yes and no. I don’t know if there is generic solution that would work in all cases, although if you table has limited number of partitions and packet size is not huge there is one trick you can do. 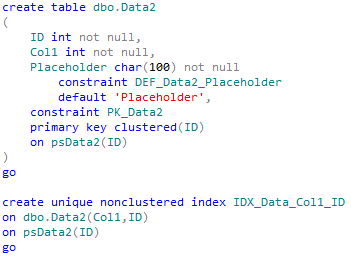 Let’s take a look at the picture that shows how non-clustered index is aligned. Each PData CTE uses $Partition function that limits data search within the single partition so SQL Server can use ordered index scan there. 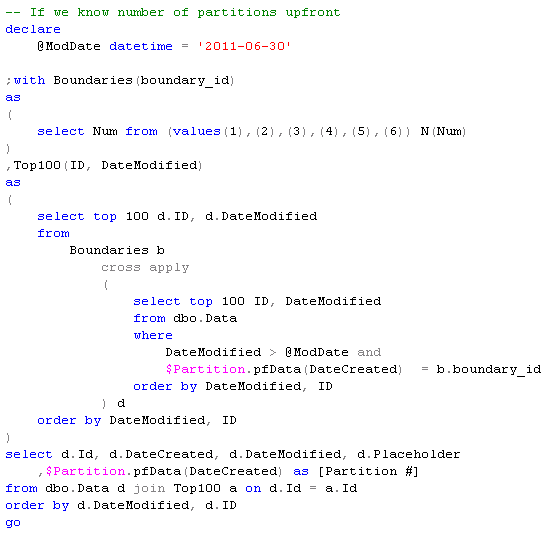 In fact, it would be very similar to what we had when we did the select against non-partitioned table. Next, AllData CTE merges all results from PData CTEs and sort them based on DateModified and ID – returning top 100 rows. Last select joins the data from the main table with IDs returned from AllData CTE. 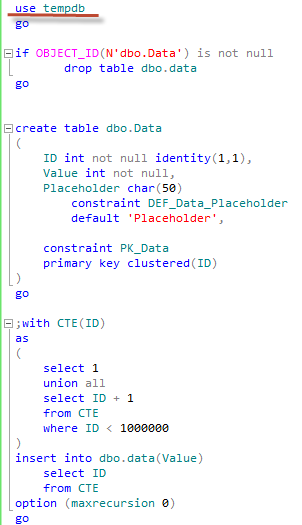 One very important point I want to stress – as you can see, PData/AllData CTEs don’t select all columns from the table but only columns from the non clustered index. 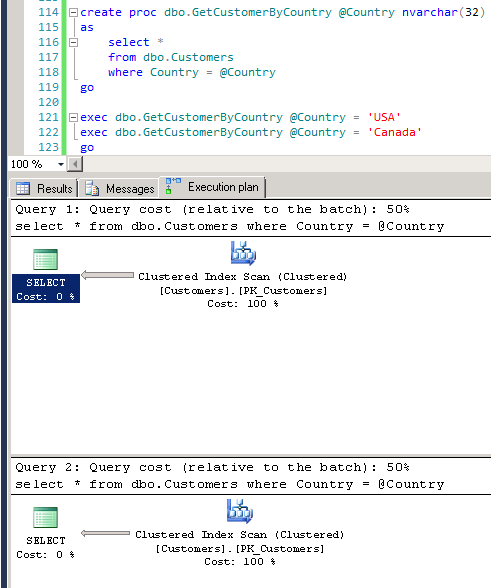 Data from the clustered index selected based on the join in the main select. This approach limits CTE operation to use index only and avoids unnecessary key lookups there. 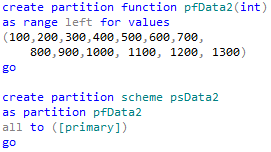 If we look at result set, we can see that data is basically selected from partition 3 and 4. And now let’s look at the execution plan. As you can see, red rectangles represent PData CTEs. There is no key lookups until very last stage and those lookups are done only for 100 rows. 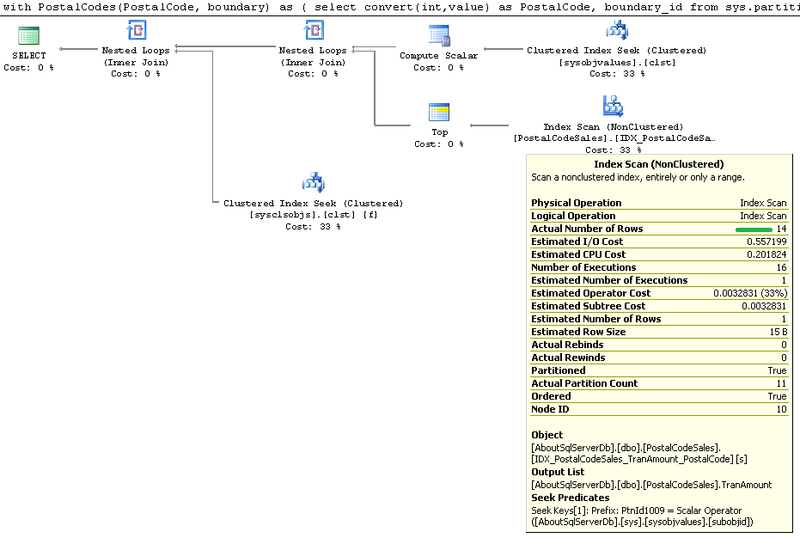 One other thing worth to mention that SQL Server is smart enough to perform SORT as part of Concatenation operator and illuminate unnesesary rows there. 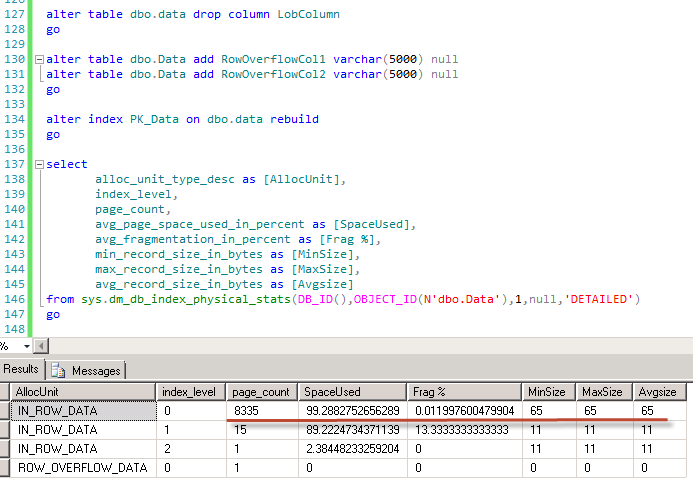 As you can see, only 1 row is returned as part of PData5 – SQL Server does not bother to get other 99 rows. This particular example has the data distributed very evenly (which usually happens with DateCreated/DateModified pattern). Generally speaking, cost of the operation will be proportional to the number of partitions multiplied by packet size. So if you have the table with a lot of partitions, that solution would not help much. On the other hand, there are usually some tricks you can use. Even in this particular case you don’t need to include PData6 to the select. This partition is empty. Also, you can put some logic in place – perhaps create another table and store most recent DateModified value per partition. 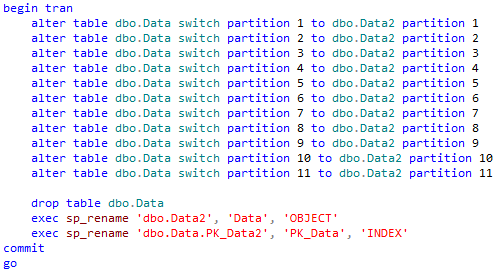 In such case you can dynamically construct the select and exclude partitions where data has not been recently modified. 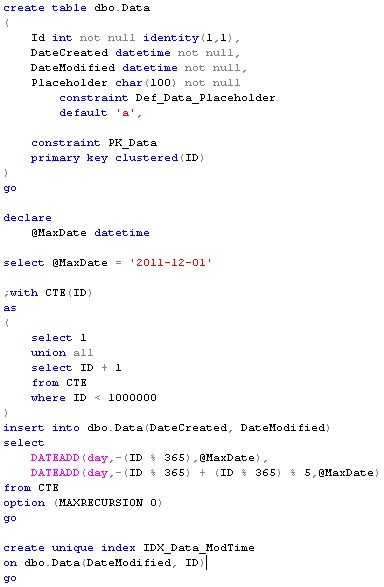 This entry was posted in General, SQL Server 2005, SQL Server 2008, T-SQL on December 18, 2011 by Dmitri Korotkevitch.